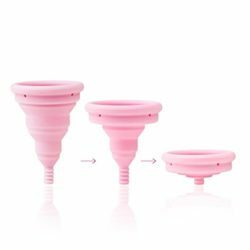 The Intimina Lily Compact is the world’s first collapsible menstrual cup! It pops down into a handy little disc-shaped carry case so you can keep it easily and discreetly in your purse or backpack. This makes it the best menstrual cup for travel as it won’t take up any space in your toiletries bag for the weeks when you’re not using it. Great huh? The Lily Compact comes in two sizes – Size A and Size B. Neither are particularly high capacity though, due to the folding design, so if you have a heavy flow you’ll want to change it more frequently or select a different kind of cup. Diameter wise it’s a pretty average sized cup and length wise it’s not overly long so it could work well for women with a low cervix. Once expand you won’t need to worry about it collapsing on you as it holds it’s shape really well. The silicone used it lovely and smooth. Collapsible – The only collapsible menstrual cup on the market. It’s discrete, can be carried anywhere and is great for travel. Cup capacity – The capacity of the cup is quite small which means emptying more frequently if your flow is heavy. Price – The cost of this cup is on the high side. Click here to read more reviews on the Intimina Lily Compact Size A and to make your purchase. Click here to read more reviews on the Intimina Lily Compact Size B and to make your purchase.